Community Village Lawrence on July 13th, 2019 @ Abe & Jake's. The story is told of how Mike played a Hammond B3 organ with one hand playing the solo, the other playing the chords, his feet working the bass pedals and to top that he sang the meanest blues over the top of it all. Another story often heard explains how he bumped into Jimi Hendrix in New York and within a few days was playing on the Electric Lady Land album and was put on a list of people Jimi wanted in his next band. Whenever his band, Finnigan and Wood, were playing a bar in Kansas, they drew such a huge crowd that the other bars for miles around would close up shop for the night and put a sign on their door that read -- "CLOSED - FINNIGAN AND WOOD IN TOWN - GO SEE THEM"
Coming to Kansas in the Early 1960's on a basketball scholarship to KU, Finnigan soon found himself playing keyboards in local bands and decided to leave the basketball career behind. A big loss for basketball but a great win for the music industry. 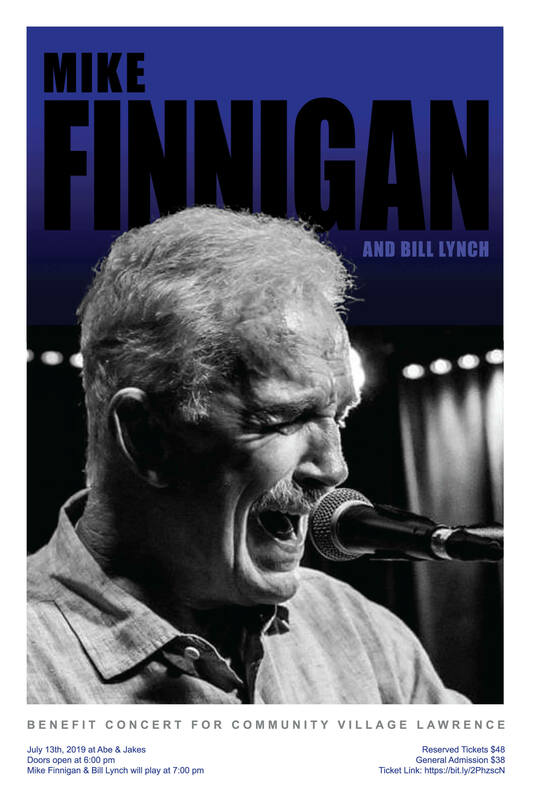 Finnigan has played with: The Serfs, Jimi Hendrix, Big Brother and The Holding Co., Dave Mason, C.S.& N, Rod Stewart, Taj Mahal and Etta James and many, many others. His latest project is The Phantom Blues Band, which was formed as a studio band to backup Taj Mahal on his CD, 'Dancin' the Blues'. Having spent many years as part of the Texas blues community, the members of the Phantom Blues Band backed and recorded with many Texas blues greats including Stevie Ray Vaughan, Freddie King, Jimmy Reed, Albert Collins and Chicago legends Buddy Guy and Otis Rush. The Phantom Blues Band members are all in their own right successful session players, producers, arrangers, composers, songwriters and recording artists. The Phantom Blues Band are two time Grammy winners and 2001 W.C. Handy Award recipients as Band Of The Year with Taj Mahal. After circling the globe playing major Blues and Jazz Festivals in Europe, Japan and Australia with Taj Mahal, The Phantom Blues Band released their first CD, 'Limited Edition' in 2003. In spite of their busy individual schedules, The Phantom Blues Band members are making time to do more live dates. from 9:30 am - 11:30 am. We welcome all ages, Members, Volunteers, and any other interested people from the community. Come join us for some great conversation and coffee and meet some of your Community Village Lawrence neighbors and friends. Please join us when you can! Coffee, tea, water & pastries served. Click the links below to get connected! Sign up for Amazon Smile and use it every time you shop on AMAZON, whether you are a prime member or not. There is a new way to support Community Village Lawrence. CVL has registered with Amazon.com to participate in their Smile donation program. Its easy and no cost to you as Amazon contributes the full amount of the donation. Use the CVL specific link below each time you log-in (don't forget to bookmark it) and you'll have access the same selection and prices as the regular Amazon.com log-in. When You Shop for Groceries! Did you know that you can help Community Village Lawrence each time you shop at Dillons stores? Enrolling in the Dillons Community Rewards Program is easy! 2. Sign in (this is the account you have for fuel points, etc.) or create an account. 3. Click on "Enroll Now." 4. Enter EM289 as the NPO number (or you can search by name). 5. Select CVL and click on "enroll." Check out the latest Newsletter for CVL! Click on the link below to view it! The Mission of Community Village Lawrence is to enhance quality of life for the entire community by helping neighbors remain in their homes as they age. We aim to do this by creating a network of supports and services following the Village model to make aging at home a long-term, affordable option. Community Village Lawrence is a membership-based service with an expanding volunteer network. Any Lawrence resident who wishes to age in their home but feels they may need extra support is invited to join. Become a member or volunteer for Community Village Lawrence and join a strong and growing community. Visit the Membership and Volunteer Opportunities pages for more information. Community Village members and volunteers! Check the VtVN website every other Friday for the latest news about the Village to Village Network and the Village Movement. Would you, a friend, or loved one, like assistance in any of the following areas? Preparing for and attending health-related appointments? A note-taker to write down what the health professional says during the appointment? Transportation to and from the appointment, and if necessary, from your front door to the chair in the appointment room. General support and companionship throughout the entire appointment process? What is a Health Support Volunteer (HSV)? 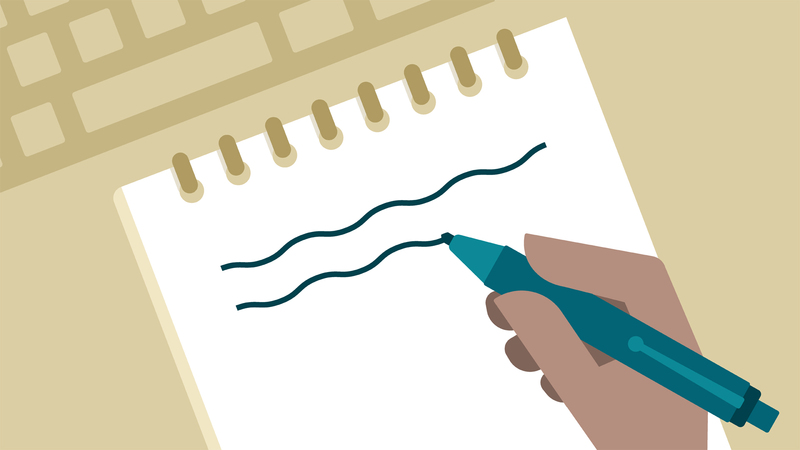 A note-taker: someone to document the communication between doctor and patient. Someone to help you prepare for and attend medical appointments. HSVs can be by your side during the entire process, from preparing to prescription pickup! General support and companionship for the patient - empowering them to be an active participant in their health care. Someone to remind you to ask a specific question before the doctor leaves or to clarify confusing terms. NOT a medical health professional or medical advocate! In June of 2018, Community Village Lawrence, unveiled a new program, Health Support Volunteer services. This program will be an addition to the services that CVL already provide. The HSV program is a service that will allow a note taker to accompany our members during medical appointments. Community Village has held our initial HSV training course and now have a number of trained HSVs that are ready for service. This program has been in the developmental stage for the past year and has been made possible by a grant from the Douglas County Community Foundation. At the first HSV training course on May 31, seven volunteers learned the proper role and responsibilities of a medical note taker. This group was led by Judy Bellome, RN (CVL Board Member) and Chala LaRocca, RN, (Wife of CVL Board Member). We had a lively discussion and each received a training manual for reference. Our new CVL Office Coordinator, Katie Whitenight and our Service Coordinator, Robert Little, were on hand as well and offered suggestions and ideas. More HSV training sessions will be conducted throughout the year to accommodate member needs. An HSV can be requested by any CVL member in need of a trained volunteer assisting during a doctor’s appointment. The HSV is a note-taker and NOT an advocate! The goal of this program is to support CVL member’s involvement in their own medical care. Special attention is given toward confidentiality and support of the member throughout this service. The CVL member meets with the HSV prior to the scheduled doctor’s appointment to create a list of the member’s priorities for the medical appointment. An example might be the CVL member wants to discuss problems with prescribed medications. The HSV can remind the member to ask questions from this list during the appointment. The HSV will record the doctor’s answers to the member’s questions plus any additional observations and treatment instructions. The note-taker (HSV) concludes the service by typing up the notes from the appointment, reviewing them with the member and leaving a printed copy for the member’s future reference. a PBS special on the national Village Movement! To view the full story and a transcript -- click here! We are proud to be a member of the Village Network. Click on the image to the right to learn more. We aim to do this by creating a network of supports following the Village model to make aging at home a long-term, affordable option. National Public Radio's (NPR) Ina Jaffe explores the positive impact that over 200 Villages have made for seniors. She discovers that, with a little help from neighbors, Village members can expand their options for independent living and make new friends in the process. In her report, Jaffe explores how three different communities have personalized the concept of a Village: 1) Beacon Hill Village in Boston; 2) Englewood Village in Chicago; and 3) Community Connections, a rural Village in California. the image to the right to learn more.